In recent times people tend to use webmail services like Gmail, Yahoo Mail, Outlook.com etc most of the time. Many users use their company mail as well however they prefer to use the web-mail services. How often has it happened that you clicked on an email address on any web page and your default email client opened? In this tutorial we will resolve the issue. To setup the default email option at Firefix you need to first navigate to the Options menu. In the pop-up window tab down to the Application TAB. If you scroll down you will see the mailto option on the left side under Content type. 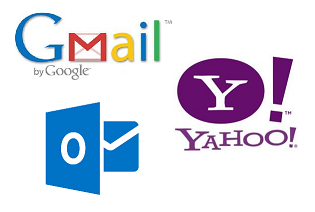 By default you wil have the option to choose Gmail or Yahoo as your default mail client. If you are using other browsers like Internet Explorers you can use Google Toolbar to set up Gmail as your default email client. It is also quite simple to setup IMAP or POP services now as well on desktop email clients which works with most services like Gmail / Outlook.com etc. View our tutorial on how to Setup Gmail on Outlook Email Client. In Firefox under Applications there is no ‘mailto’ option. I am using Windows 10.